Your Deja Vu is valid here. 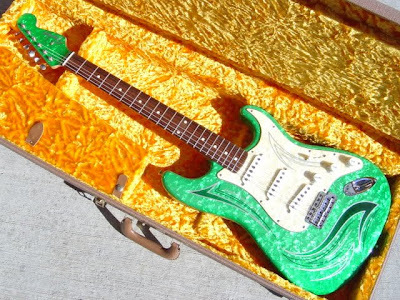 I featured this guitar in March '09, though not as a Friday Strat. So might as well make it one. 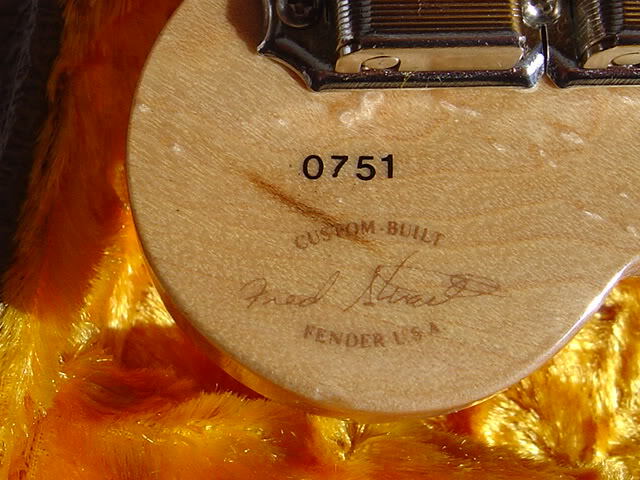 This Fred Stuart Masterbuild Art Guitar from '98 is part of a "Triple Threat" matching set which includes a Tele & a Jazzmaster. All three have been sitting on eBay for a looooong time. I keep running into them! The seller is listing the 3 separately, but they probably oughta stay together, which is most likely the general consensus out there. So until somebody with deep enough green interest & green POCKETS comes along, this Triple Threat will remain an eBay fixture. The seller seems comfortable enough with it. No sacrifice here! Seller: FLIGHT-101 eBay Store - 100% rated with 3000+ positive feedback score. Go check out all three! Listing has lots of photos and details. 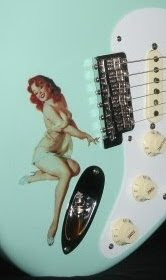 The headstock faces & bodies are clad in crazy green moto, with pin stripping by Lil' Louie, a SoCal hot rod detail master.